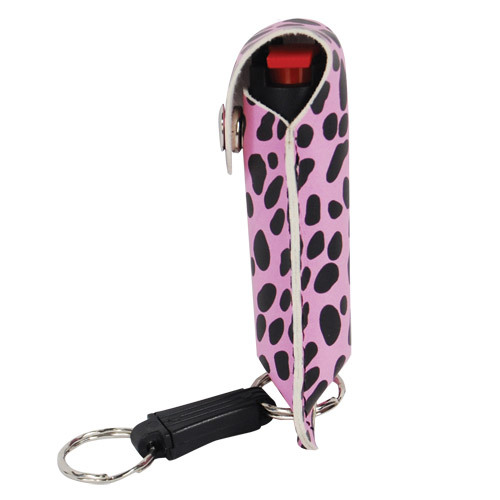 WILDFIRE® PEPPER SPRAY is hot, hot, hot. The Major Capsaicinoids are the true heat measure, WildFire has the hottest on the market at 1.4% Major Capsaicinoids. In addition to causing an attacker pain WildFire 10% oleoresin capsicum formula swells the mucous membranes, which makes breathing difficult, and swells the veins in the eyes, causing the eyes to close. These new designs are well recommended by college students everywhere in the US. They just love the new designer leatherette cases because they fit their hip styles. The college students say "They never leave home without it. You want to make a fashion statement but you want to be protected as well. Don't compromise your personal safety...accessorize with these fashionable options. These animal prints fit with just about anything and ensure you have the safety and security you need while out and about. Mothers, daughters, college students, teens and everyone in between should always carry some form of personal protection with them at all times. A simple but inexpensive self defense spray does the job of immediately stopping an attacker and rendering him incapable of pursuing an attack. A short blast to the face is all it takes to halt a crime from happening. Best of all, it gives you the time and opportunity to get away and find help. Report any attack to the authorities and give them any details you can remember. Getting the person off the street so they can't harm or go after anyone else is the goal. Police use this stuff for one good reason: It Works! Ask anyone who has ever been exposed to Oleoresin Capsicum how it feels and they will all tell you they never want to experience it again. Just because it doesn't cost much, doesn't mean it's no good. It's cheap but its effect is priceless! Effective range of up to 8 feet. Pepper spray cannot be shipped to New York or Massachusetts.